My long absence has been due to a very busy couple of weeks. It started when school started for both Simon and myself. I also had two big class weekends. On August 30 and 31st I had my Christmas In July (August) class. Then on the sixth I ran two classes, an altered lunch tin and the interactive Haunted House Book. All of those classes took a lot of prep work. Luckily this Saturday I am just teaching at a birthday party with fewer cards and very little prep work! We also started T-Ball. Simon is on the Knights this fall. Our first practice was Tuesday and the first game was Sunday. It's a lot of fun to watch the little guys play. Now on to the creative portions for today. 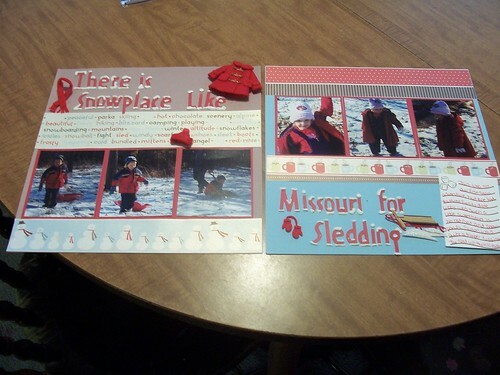 First off I have two scrapbook layouts that should have been for the last two Thursdays. 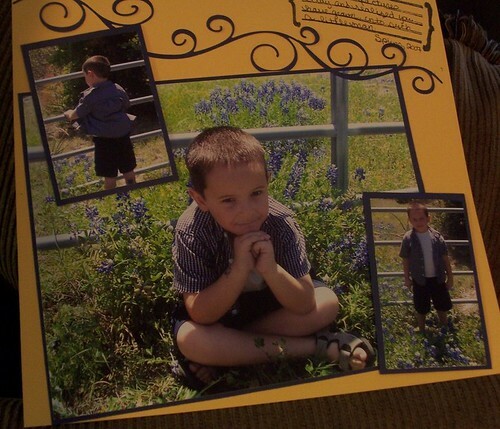 The first layout is some more bluebonnet pictures, this time of Simon. These pictures made me realize how much he has grown up this last year. He's not a preschooler or a little guy any more. My second layout is from last winter. We actually got to do a bit of sledding while we were in Missouri. I have been working on this layout for about three months. I had a hard time finding a sled. Then one day I found the sled with the red coat in a Jolee's set that was just meant to go on my layout! The last item I have to share with you is a Halloween wreath. 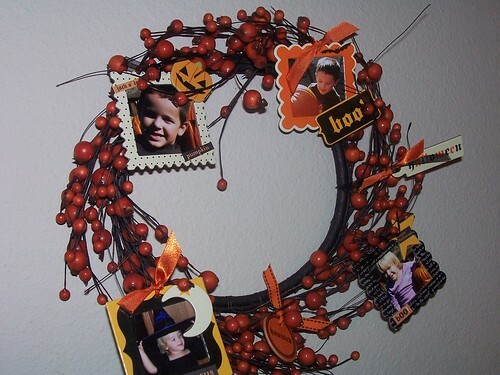 I purchased this wreath kit by Making Memories last year after Halloween. They had these wreaths on clearance marked down from $19.99 to $1.99 so I could not resist. However, I am horrible at purchasing clearance items and then never completing them. I have promised myself to complete some of the things I have purchased this year instead of letting them gather dust in the closet. Bluebonnet Layout: Cardstock from DCWV, scroll die cut from Sizzix, journaling block stamp by Scrappy Cat. Winter Layout: Patterned paper by Imaginese, bazzil cardstock, Jolee's embellishments, liquid applique.